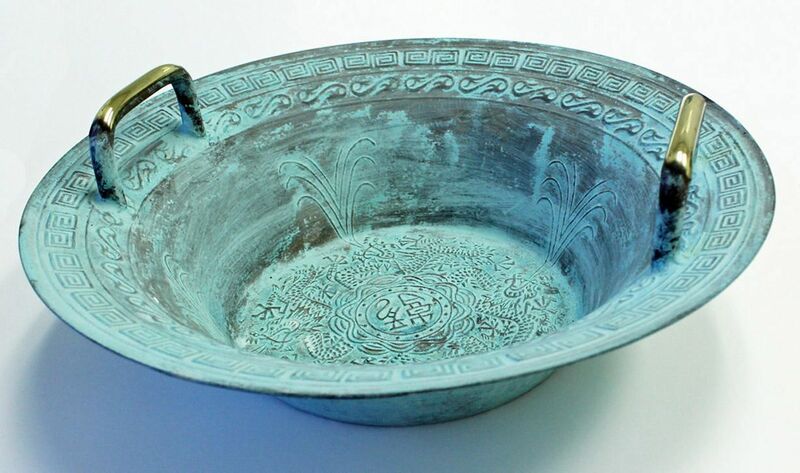 The Chinese Spouting Bowl first appeared in the Han Dynasty (202 BC - AD 9). Four “Han” dragons can be seen in the bottom of the basin, spraying streams of water up the sides of the bowl. It is said that the bowl was a kind of plaything for nobles, gifted scholars and socialites in the Ming Dynasty. It was believed to foster happiness, prolong life and increase strength. Use the Resonance bowl to demonstrate the behavior of waves and their interactions. Due to the vibrations caused by the rubbing of the handles, the water surface begins to ripple around the rim. Soon water drops shoot up, quickly becoming continuous streams, like tiny fountain jets. The water droplets and jets grow and diminish with each rub of the handle. It is believed to generate the precise frequencies needed to produce standing waves - the spouts of water rise from these waves.